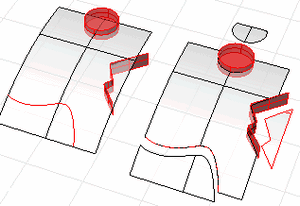 The Split command divides objects into parts using other objects as cutters. ● Use Untrim to remove a trimming boundary from a surface. ● When you split a surface with a curve in a plan parallel view like the default Top, Front, and Right view, the cutting curve is projected on the surface in the view direction. ● When you split a surface with a planar curve in an angled parallel or a perspective view like the default Perspective view, the cutting curve is projected on the surface in a direction perpendicular to the curve plane. ● When you split a surface with a 3-D curve in an angled parallel or a perspective view, the cutting curve is pulled onto the surface by closest points. You can select multiple objects to split with multiple objects. 2. Select the cutting objects. 3. Press Enter to end the command. Pick locations on the curve. Split an object by its own isoparametric curves. This option only appears when a single surface is selected. Note: Use the Int object snap for snapping to isoparametric curves intersections. Splits a surface with isoparametric curves in the surface u-direction. Splits a surface withisoparametric curves in the surface v-direction. Splits a surface with isoparametric curves curves in both u- and v-directions. Determines whether or not the resulting underlying untrimmed surface shrinks close to the trimming boundaries similar to the ShrinkTrimmedSrf command.